/ Modified jun 16, 2017 2:18 p.m. 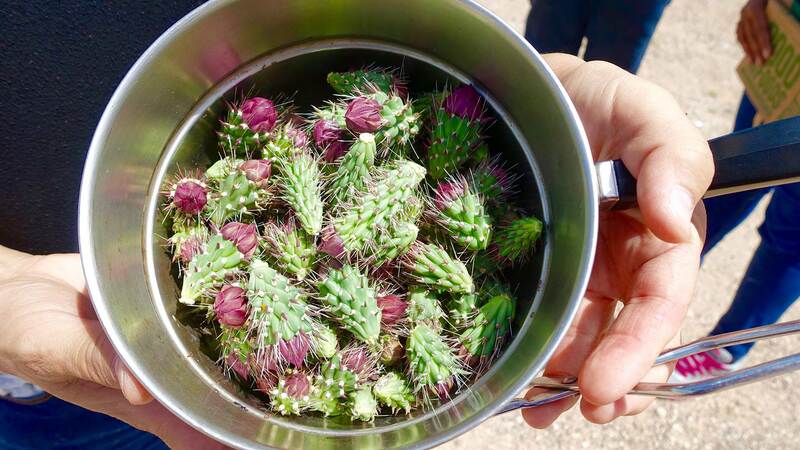 Learn how to forage for cholla buds and process them for consumption. The blossoming of Tucson’s foodie scene in recent years and its designation as a UNESCO World City of Gastronomy has raised interest in the city’s rich agricultural history and the many edible plants that grow in this region, which have been part of residents' diets for thousands of years. One of those foods, itself going through a bit of a culinary renaissance, is the cholla bud. Often said to taste like an artichoke heart or asparagus, the cholla bud is packed with nutritional benefits. It's high in calcium and pectin, which helps lower blood sugar. And it grows in our backyards. 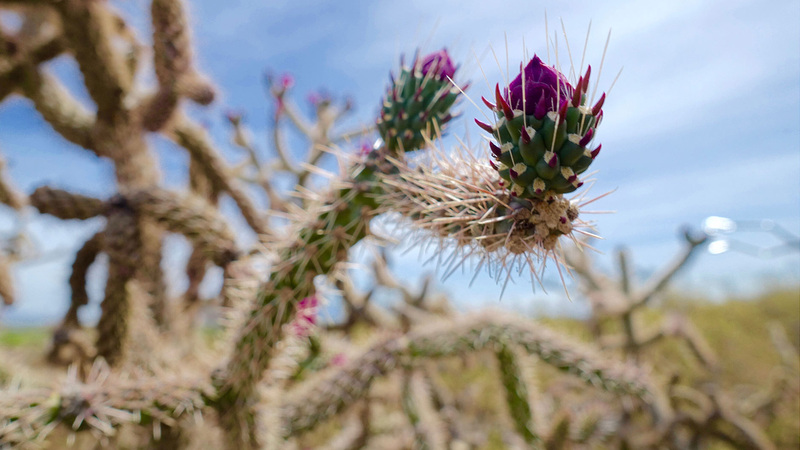 On a windy day in late spring, Tanisha Tucker met Rusty Ramirez and Traci Hamilton to collect buds on a cholla-rich patch of desert near the San Xavier Mission. VIEW LARGER Tanisha Tucker, Rusty Ramirez, Traci Hamilton and her kids Tonalli and Eric Bustamante pose after foraging for cholla buds on a windy day this Spring. Tucker and Hamilton are experienced foragers - not the case with Rusty, who said she had just recently harvested for the first time. "My nana is moving to Washington," she said. "And they don't have chollas there, so I was going to dry them out and send them to her." After Hamilton sang a blessing, which she said was to honor the plants, the foraging began. "...and tongs. Definitely for the cholla buds - tongs." 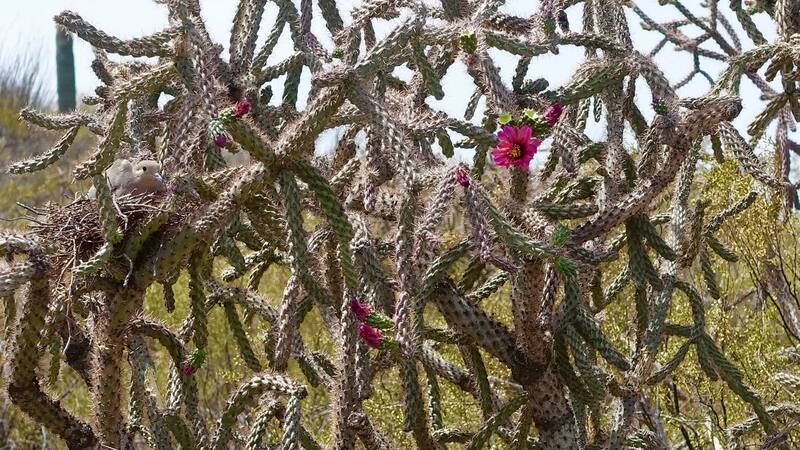 Just like the cactus they grow on, cholla buds are covered in spikes. Thorns are an inevitable hazard, but Hamilton said they don't bother her. 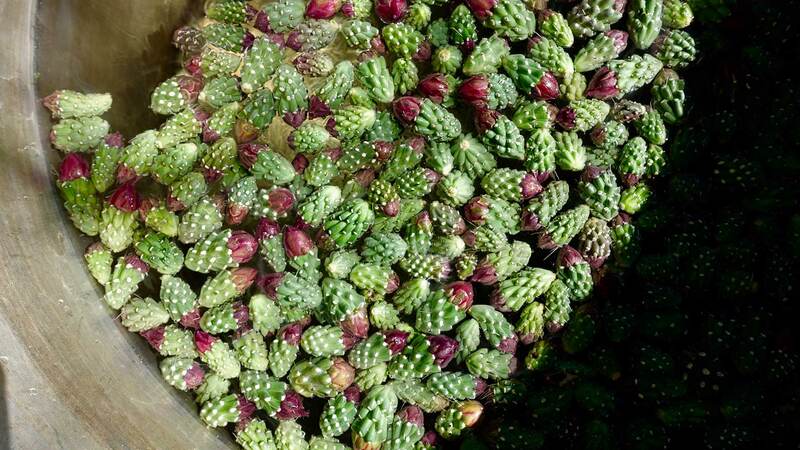 "When you're used to picking cactus foods, you get used to the needles. You might take them out tomorrow, or your body pushes them out." As the group moved from plant to plant, Tucker said that it’s important to choose the right buds to pick, but more important to know which not to disturb. VIEW LARGER Tonalli Bustamante with freshly plucked cholla buds. "We never like to completely strip the chollas," she said. "We like to leave some of them to bloom and of course we have to remember the animals and everyone else who enjoys the desert foods that are out here." Cholla buds have grown in popularity in recent years in the haute cuisine of Southern Arizona. They now appear on the menus of some of the city's finest restaurants, like Downtown Kitchen + Cocktails. And Hamilton said she has concerns about more people becoming interested in harvesting cholla buds. "When you're not really brought up in theses ways and you don't have that cultural background, you don't really have the - I guess it's a respect for the family of cholla here. They're living beings. All these plants here - the cholla, the ocotillo, the saguaro, they're our relatives and we treat them respectfully." She said that's one of the reasons she forages in the desert. 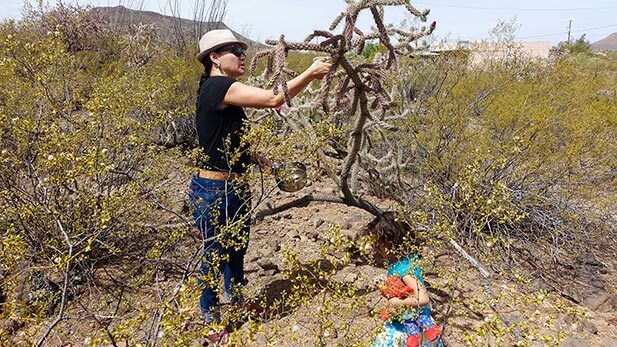 She wants to teach her kids, Eric and Tonalli, that their lives are connected to the plants that grow all around them. 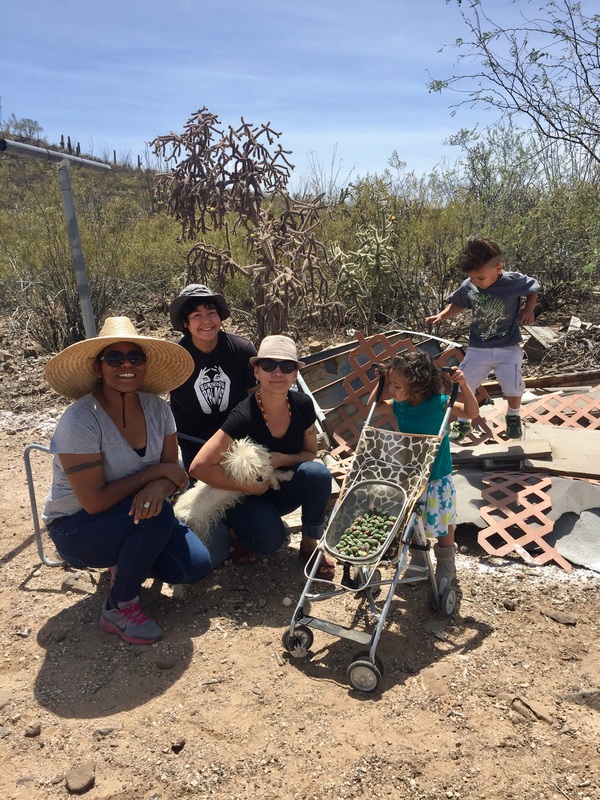 And just down the road from where the women are harvesting, the San Xavier Co-op Farm also strives to teach the Tohono O'odham and broader Tucson community about responsible desert harvesting. At the farm, cholla buds are more often called by their Tohono name: ciolim. 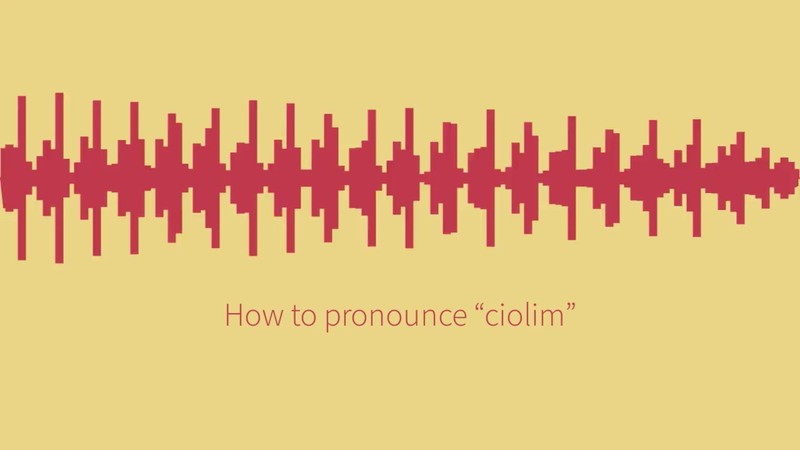 Learn how to pronounce "ciolim"
Produce coordinator Jamie Encinas runs ciolim-harvesting workshops in the spring, and several days a week the farm buys buds from the community. Those buds are processed from their raw, recently plucked form for consumption. The first step? Removing the thorns. The farm's Raymond Antone and Gabriel Mendoza spread 10 pounds of ciolim across a large mesh screen and shook it back and forth. Thorns fell to the ground and, eventually, the majority came off. Next, Antone tossed the buds into a large pot of slowly boiling water, heated by a mesquite campfire. "We're not really cooking it, we're just getting them nice and plumped up with water," said Antone. After they've been cooked, either the buds are ready to be eaten - in salads, added to scrambled eggs, or just eaten on their own. Or they can be dried out and preserved for years to come. Mendoza said he's been eating ciolim since he was a kid. "When I first had it," he said, "it was really just tangy. ... I've always had a taste for it. There wasn't anything to compare it to. Now people come to us who have had it for the first time and say it was close to artichoke or asparagus for them, which I can see. "To me, it just has that natural flavor and the taste of the desert." 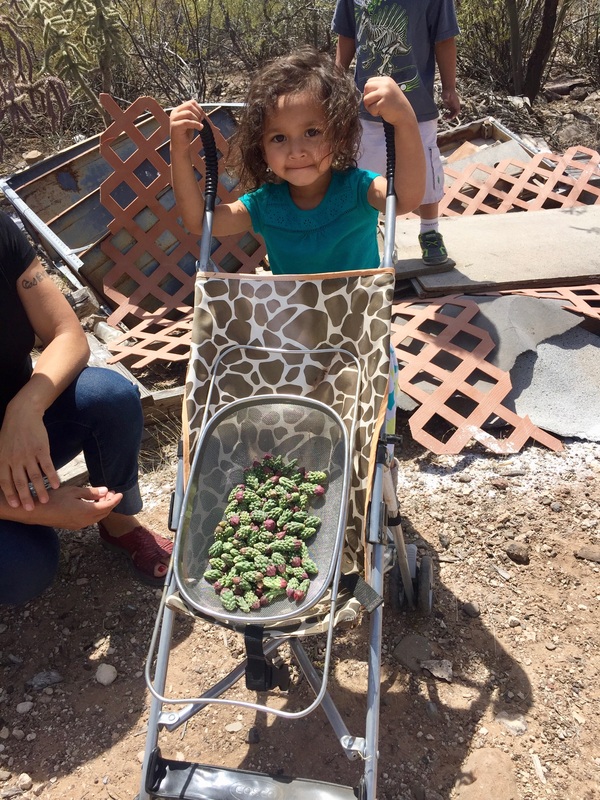 Click here to learn more about the San Xavier Co-op Farm.